Anxiety can affect dogs in different ways. Some become aggressive, some hide, some whine, some find it harder to house train, and they all want to feel happier and more confident. Many owners don’t realize that dog training can solve this problem. Anxiety is not a behavior problem in the sense that the dog is behaving badly. Usually, there is just some kind of communication issue between dog and owner that has them on edge. Dog behaviorists/dog trainers can help you learn to effectively communicate with your anxious dog and put them at ease. 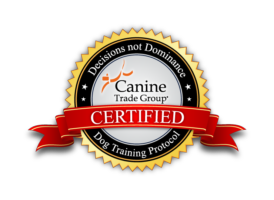 I specialize in basic obedience as well as in canine psychology and training theory, so I can understand your dog’s behavior and help you do the same. Recently, I was called to help a dog, Lucy. Lucy was very timid, only barking at strangers from a distance and never approaching. She usually kept her tail tucked between her legs, exhibited signs of severe stress, and often failed to use the bathroom outside of the house. There were a few factors at work here. Lucy came from a breeder who was more interested in making money than actually caring for the puppies, and the owner was hesitant to walk Lucy during the cold winter months. I set a training regimen in motion that would get Lucy on a consistent schedule, boost her confidence, and get her house trained. One technique I used was crate training. Lucy had a crate, but most owners don’t quite understand how to help make a crate feel like home to their dog rather than confinement. It can also be used as a house training tool because dogs generally don’t like to mess where they sleep. We implemented basic obedience training to help the owner bond with Lucy while at the same time teaching her what was was expected of her. When anxious dogs know what to expect and learn to count on a certain structure, they gain confidence. They learn to trust their owners and come out of their shells a bit more. Consistent walking also played a big role in Lucy’s success. If you have a dog that is exhibiting signs of anxiety, give me a call today at 202.318.1380 and learn how I can help them the way I was able to help Lucy.